 As an admirer of Mrs. Limestone . . .ok, let’s be honest- I’m insanely jealous of her life- living in NYC, having a BEAUTIFUL house, traveling the world- (insert sigh). Well at least I can live vicariously through her blog, which I am so excited to be guest posting on today!!!! I decided that my FAVORITE posts to read are Before and After Makeovers, so that’s what I wanted to supply. One spot that I really love is our dining room! Here is what it looked like when we bought the house. We wanted to open things up, so we took out the wall (which we did all on our own I might add!!!) No extra MANpower needed!!! We also moved the kitchen, which you barely see in the picture. For symbolism (of what we love) we display an architectural model and plans around the hearth. As a fireplace “screen” of sorts, I used some metal wire and upholstery tacks. I love how it resembles a corset. And if you are wondering why you can see the cowhide rug in this picture, it’s because the fireplace inset is lined with a mirror. On the opposite side of the room, we had an off-centered window to deal with. 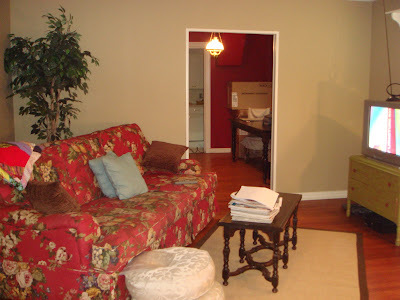 A wall of fabric fixed the problem and added softness to the space. By adding some more DIY artwork (find instructions here and here we made sure this wall didn’t feel neglected. The furniture filling the space ALL came from garage sales. Tim and I refinished the $7 dining table and added some glazing, made a $5 coffee table become bench seating, and reupholstered the two armchairs (that cost me $5 each). They used to look like this. Finally we needed a light fixture that would really make a statement. Old canning jars were not only economical, they were perfect for the personality of our cozy 75 year old cottage. A couple more pics. . .
TOTAL dough dished out: $485- Not to bad when you’re starting from scratch! Thanks so much for taking time to read about our renovations. Feel free to visit my blog anytime! Way to add your own FP! Crazy creative and fun quirky details! That light fixture is great! The canning jars are fantastic. I'm a big, big Made2Create fan! Thanks so much for letting Kara share here. Can you believe how talented she is? wow! i'm inspired to make my own faux fireplace in our bedroom!! and i LOVE the canning jar light fixture - so fun! Wow, the light fixture is genius! Nice!!! I love how much was accomplished on a budget! Amazing! Just love everything you did!!! Wow it looks great! Very quirky and fun, but sophisticated at the same time! I never would've guessed it all was done for under $500!!! What a great post with all of the DIY! Go check out her blog and see all of the other great things too. Wonderful! That's a stunning before and after. That jar chandelier is fantastic! Absolutely gorgeous! I'm going over to check out your blog - desperately hoping there's a tutorial on the canning jar chandelier. Love it! The light fixture is to die for. I think you should flip it, I'd be the first in line to buy. And the fact that it was all done inexpensively makes it even better. I love what a little creativity can do! I love it all, and I love the total cost even more! Very inspiring! What a transformation! I've said it a hundred times but the creativity of bloggers is mind-blowing!! There are so many things I love but the obvious one is that kicking light fixture!! What a great makeover and so much pizazz for so little $$$. Genious! I wnat you to joun my party ~ Timeless Tuesday since the classic piece I wrote about today is the use of mirror. Very well done here!! that jar light is amazing! what a cool diy idea. thanks for sharing, and i hope you have a lovely week! Wow...what a great makeover! Very, very creative touches. I LOVE the chandelier! Thanks for sharing! Wow! Kara, this is tremendously impressive. Your use of pea gravel is so creative and I am drooling over that chandelier. Big thanks so Mrs. Limestone for introducing us to you!! I just wanted to say thanks so much for all the comments and give a special thanks to Mrs. Limestone for allowing me to guest blog! It means so much to me that other people enjoy my designs, thanks again!!! There are so many parts to this room that I love....particularly the fireplace pebbles and the jar light fixture. Those jars are darling! Love the animal rug under the table. But don't you worry about things spilling on it? It looks great! It's got style without being too sparse or frou frou. Nice. Absolutely LOVE the cowhide rug!! Great job! the jars! the jars! I'm in love! Are the lightbulbs actually in the jars? It's hard to tell. If so, doesn't that make the bulbs extremely hot? I thought they need air circulation to stay cool. The idea is so creative just wondering about the technical specs. I love the room! What color did you use for the walls?